My favorites so far are the Pentel Aquash water brushes. Why? They have a nice, medium stiffness, good capacity water reservoir, good price for a set of three with a nice selection of the water brush sizes, readily available, the caps fit well, have an even water flow, and they are shaped so they don't roll off the table.I also like that the water reservoir is blue, but that's just a thing. My second favorites are the Derwent Water Brushes and the Kuretake Petit. The Derwent Water Brushes are quality brushes similar in many ways to the Aquash except that the bristles and shorter and stiffer. Derwent Water Brushes, though, rely on the caps to keep them from rolling which I find inconvenient. The Kuretake Petit is a single type of brush as far as I can tell -- most of the labelling is in Japanese -- but it's a great little brush for quick work or to take with you when working away from the studio. Last in line, even farther back than the no-name extra capacity water brushes I got on ebay, are the Royal Aqua Flo. 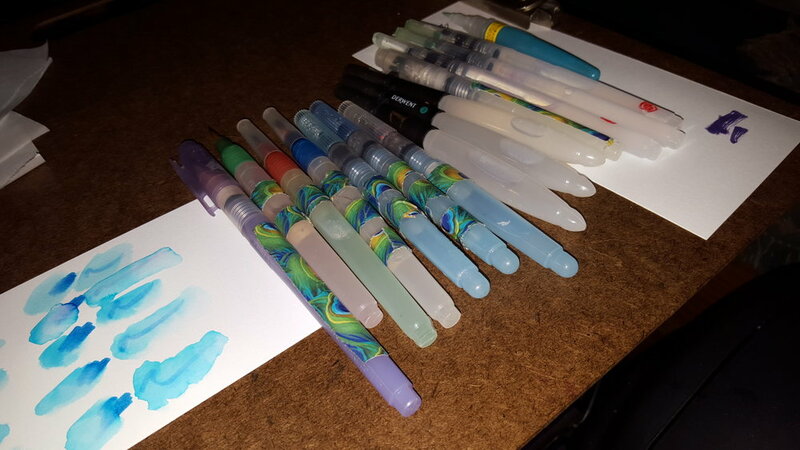 The Royal Aqua Flo are too soft bristled for my taste, the caps fit horribly and are very easy to lose, bristles get damaged from painting too easily IMO, and once you get them going, they tend to over-water the painting you're working on. In some cases they're recommended for adult painting, but in others they are advertised as children's. In my opinion, they are best for children's work. There are a number of brands/types i haven't gotten to try, though, like Sakura's Koi water brushes. Do you have a favorite? Since I wrote that I have been able to try two new brands. Sakura Koi water brushes and Yatsutomo Niji water brushes. In both cases they are built more like the Pentel Aquash for bristle length, but seem to me to be a bit softer. The Niji also has a clip on the cap, though it's made of thin plastic, so I'm not sure I'd trust it. Niji is round in cross-section, and without the cap the brush tends to roll. The Koi has a slightly oval cross-section so it doesn't roll off the table. On a totally personal note, I love the bright blue water resevoir on the Niji. Again, I'd like to know what your favorite water brushes are and why. Please let me know in the comments.